There’s a very specific formula we use with clients to make sure they end up with the house that best fits their needs and budget. It requires some initial patience to make sure things are done right (and then you are prepared to quickly put in an offer with confidence when you reach that point!). No one should rush out to purchase a home before they are ready since this is a big financial decision. Remember that slow and steady gets the “prize”! We first recommend that you determine your deal breakers, “must haves” and lifestyle goals. We covered that process in a previous article from this series —12 Questions to Answer Before You Step Foot in an Open House. Go back and read it again, and then you can move forward once you’ve answered the 12 questions. Now you’re ready for the next three important steps. But do not bypass these steps since you’ll end up wasting time, getting confused and, ultimately, buying a home that you will regret. We see many clients start looking for a home before they are truly convinced that buying a home is right for them. (Maybe their friends are doing it, they’re getting older, they’ve rented forever, etc). They think that by just looking at homes that it will help them make that decision. However, this is a sure recipe for making a big mistake! You must first make the decision that you want to make the commitment to being a homeowner. Buying a home is a big deal and a commitment that you have to be willing to make for at least three to five years, if not more. First decide whether this step in life is something you want to make and then commit to the process of looking for the perfect home, no matter how long that takes. Especially with our tight housing market, the looking process can be frustrating, difficult, and hard to see through to the goal of becoming a homeowner. Don’t set yourself up to fail by thinking that if you found the right home, then you’ll become a homeowner if you buy it. Instead, make the conscious decision that buying a home is the right move for you right now—both financially and otherwise—first and foremost. Then you’ll be more committed to go down the (long!) road to becoming a homeowner and not look back. Often times, we spend so much time thinking about wanting to buy a home that once we make the decision to buy, we want to find a home ASAP. We call this immediate gratification syndrome and don’t let it get the best of you! We understand that you’ve been waiting all your life to have enough money, to be settled in your job and life in order to buy your first home. But you can’t just wake up one day and go buy the first home you see. It’s truly a process and you want to make sure you are making the best decision for your financial life and for the overall life you want to live over the next few years. Figuring all that out and having a home that fits your goals does take time. We always say, buying a home is like finding a mate and just because you decide you are ready to commit doesn’t mean you should marry the first person you go on a date with. Same thing with buying a home — once you’ve decided buying a home is the commitment you want to make, slow down to find just the right home for the life you want to create. That takes time…. Take a deep breath, slow down and understand the process; you might just enjoy it more and will find that perfect home! There is a lot more than meets the eye to buying a home. You need someone experienced in the type of home you are buying—price range, location, and loan programs you’ll be best suited for. Not every agent knows how to help every buyer. Start with getting recommendations from friends and family. Think about where they bought and their price range. Only ask people in your life who would be buying something similar. Ask them what they liked and didn’t like about the agent they worked with. Once you have a list, reach out to at least two to three agents and ask them how they work and where they have sold homes recently and in what price range. Then set up an appointment to meet them for an initial consultation. You don’t need to know everything about the home-buying process before you meet, they should be educating you about the process and what you need to know to make your first purchase successful. Some internet research on your own is just fine, but your agent will get you up to speed on the current real estate market, provide insight on local neighborhoods, and also advise you on mortgage options and home-buying assistance programs for first-time buyers. Be honest with your agent and soon you’ll get a sense if you and your agent will be compatible and well-suited together. It’s important to have a good working relationship and be attuned to each other. That way, your agent will “get” you and be able to also anticipate your likes, dislikes, and needs in a home even better than you may at this point! This is important since you want your agent to guide you toward homes that will work best for you, and your wants, needs, and budget … and not waste time on homes that do not. 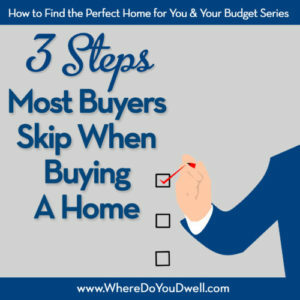 Congrats, you did not skip these important three steps! Now you can move forward. It’s time to figure out how to pay for your new home! Next week, we’ll cover how to budget for and finance your first home purchase in our series, How to Find the Perfect Home for You and Your Budget.